Guided tours and programs are led by trained museum educators, self-guided groups tour on their own. Group visit options have different rates (Rates A, B and C). General and themed guided tours at Jamestown Settlement and the American Revolution Museum at Yorktown are available under Rate A. An educational program with a guided tour at Jamestown Settlement and the American Revolution Museum at Yorktown is available at Rate B. If no educational component or guided tour is desired, self-guided visits are available at Rate C.
Group = 15 or more paid visitors using one form of payment. Combination Ticket* = one visit to each museum and may be used on different days. "Best Value"
Youth/Student Ages** = With general admission the youth age is 6-12, and children under 6 are complimentary. For groups, the youth/student age is kindergarten through college. Prices are per person, reservations are required and subject to availability. All admissions are valid for the full day and include galleries, living-history areas and film. 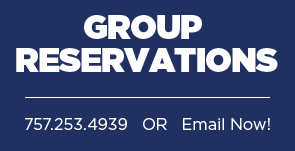 Contact Group Reservations for additional tour and program options and to book your group at group.reservations@jyf.virginia.gov or 757-253-4939. RESERVATIONS: Reservations are subject to availability and should be made as soon as travel dates are selected. Reservations are required at least 72 hours in advance for programs and guided tours and are requested for self-guided visits. PAYMENT/COMPLIMENTARY POLICY: Payments must be made in advance or on the day of your visit. Cash, Visa, MasterCard, Discover and checks made to the Jamestown-Yorktown Foundation are accepted. Date of visit, reservation number, group/school name, contact name and phone number must appear on check. Group rates are available for 15 or more people with one form of payment. Guests paying separately will pay the general admission price. Youth/student groups are eligible for one complimentary chaperone admission with every 10 paid. FINAL COUNTS/ CANCELLATION POLICY: Please confirm your travel plans 30 days in advance. Final counts/cancellations must be received 72 hours prior to arrival. If you must cancel, please obtain a cancellation number. No shows will be billed. PARKING: Complimentary parking is available for cars, motorcoaches and school buses. DAY OF ARRIVAL TOUR TIPS: Plan to arrive at least 30 minutes prior to your scheduled visit time to register and use the facilities. Designate one person responsible for payment procedure; one payment is required for the entire group. Proceed to the museum lobby/group check-in to register and pay for the visit. If your group is scheduled for a guided tour or program, your guide will meet you at the bus drop-off area. Please bring confirmation letter.